FILE - German Chancellor Angela Merkel gestures at a news conference with NATO Secretary-General Jens Stoltenberg in the German Chancellery in Berlin, June 15, 2018. Chancellor Angela Merkel assured parliament Wednesday she takes seriously Germans' concerns about crimes committed by migrants and pledged a strong response, but condemned recent demonstrations as "hateful," saying there is "no excuse" for expressions of hate, Nazi sympathies or violence in response. 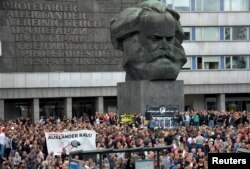 FILE - Right-wing supporters protest after a German man was stabbed last weekend in Chemnitz, Germany, Aug. 27, 2018. The banner reads, "Criminal foreigners out." Merkel assured lawmakers that her government was equally aware of its responsibility to take the wider concerns of the public seriously, and that it was working with "all resolution" on the issue. "We are especially troubled by the severe crimes in which the alleged perpetrators were asylum-seekers," she said. "This shocks us... [and] such crimes must be investigated, the perpetrators have to be taken to court and punished with the severity of the law." Alexander Gauland, a leader of the far-right Alternative for Germany party whose members marched alongside the neo-Nazis in Chemnitz, defended their participation, saying they were exercising their "democratic right to freedom of assembly." "There were a couple of aggressive idiots among the demonstrators who were yelling 'foreigners out' and who gave the Hitler salute, nobody disputes that," he said. "That is distasteful and criminal, but it was a minority who were neither representative of the demonstration as a whole nor able to delegitimize the majority of the protesters." He accused the "political mainstream" parties in parliament of making too much of the neo-Nazis involved for their own purposes. "If it weren't for these idiots and dunderheads, if only the normal citizens were demonstrating, it would be a catastrophe for you," he said. "I think it's time for democrats in this country to defend themselves against this kind of rhetorical escalation, which will result in the abandonment of inhibitions in the end and lead to violence on the streets," Schulz said, to a standing ovation.